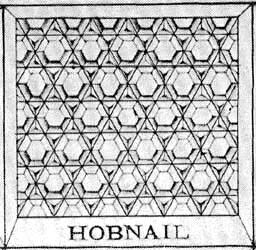 The term “hobnail” refers to a nail with a large head. 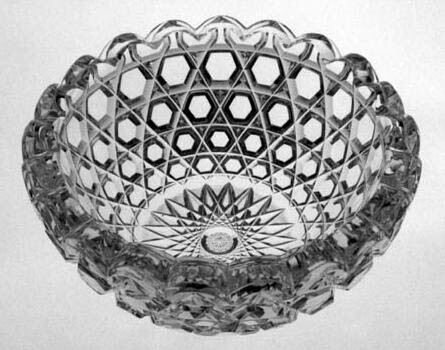 In cut glass a hobnail can have any number of side but usually — except in the motifs/patterns of cane and Russian where it is octagonal — it is six-sided. A six-sided, or hexagonal hobnail, is produced by three intersecting sets of parallel miter cuts. The size of the hobnail can be quite small (“baby hobnail”, informally). Small hobnails are sometimes mistaken for a diamond cutting. At the other extreme, several companies cut a pattern called Large Hobnail. Most companies called their hobnail patterns simply Hobnail, but Hexagon Diamond was also used. Dorflinger called its hobnail pattern Hob [=Hobnail] Diamond. The term “hobnail” is often used incorrectly. In AN ILLUSTRATED DICTIONARY OF GLASS, Newman comments that the expression hobnail cutting “is sometimes erroneously applied to a raised diamond cutting, a strawberry diamond cutting or an alternate panels cutting” (p. 151). (“Alternate panels” is the British term commonly used for the cane motif.) To this list we can add the starred-diamond (block) motif, as mentioned in the ‘diamonds’ file. Although these errors are, for the most part, encountered in discussions of British cut glass, American authors have sometimes made similar mistakes. Sinclaire and Spillman (1997, fig. 25), for example, show a centerpiece (canoe) cut in the Quarter Diamond pattern by J. Hoare & Co. which they label as “the Hobnail pattern.” (This mistake was originally made in the 1979 edition of their book and was repeated in the 1997 edition.) The centerpiece has been installed as a permanent exhibit at the CMG. The last time the writer checked the pattern was still labeled “Hobnail.” Although it does not accompany his entry for “hobnail cutting” in his dictionary, Newman illustrates elsewhere in his book a fine example of the standard hobnail cutting on a decanter manufactured by Stevens and Williams, and he describes it as having a “hob-nail cutting” (p. 85). No British error here. 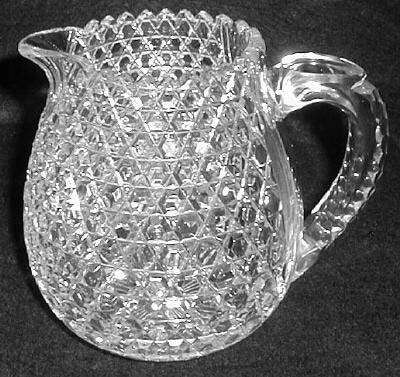 Pitcher cut in a typical Hobnail pattern of average size. H = 5.0″ (12.7 cm) (Image: Internet). Bowl cut in the Large Hobnail pattern on an unusually thick blank: 0.75″ (1.9 cm) thick. The cutting is also unusual because the bowl has a hobstar with an odd-number of points: 21 points, corresponding to 21 rim scallops. D = 8.4″ (21.2 cm), H = 3.5″ (8.9 cm), wt = 7.25 lb (3.3 kg). Sold for $225 in 1990. The center of a hobstar is always a hobnail. Because the number of sides (or facets) that such a hobnail has is determined by the number of points in the hobstar, the minimum number is five. Generally, when the number of points in the hobstar exceeds ten the hobnail looses its polygonal shape and becomes circular, especially if the hobstar is quite small. Occasionally one will find hobnails formed by triple miters, as in the patented Columbus pattern by L. Straus & Sons, shown here on a nappy, shape no. 189. The pattern was designed by Benjamin Davies in 1894. D = 6″ (15.2 cm), H = 1.5″ (3.8 cm), wt = 0.75 lb (0.3 kg). Sold for $75 in 1989. The cane motif/pattern also contains a hobnail. But it is an octagonal hobnail and should always be referred to as such. 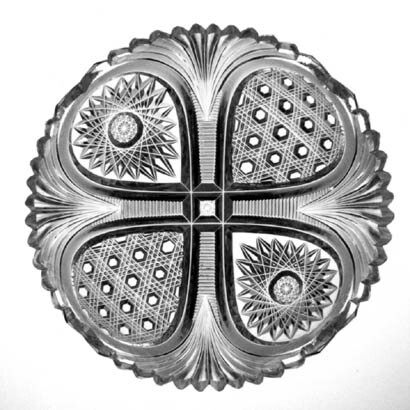 Some companies called their cane patterns Octagon Diamond; Dorflinger used the name Hob [=Hobnbail] Diamond & Lace (see ‘the cane family’ of motifs). Please see the flat and hollow cuttings file (in ‘types of cutting’ section). The three intersecting sets of parallel miter cuts that form a hobnail also form a triangle between any three hobnails (hexagons). Each hobnail can, moreover, be subdivided into six triangles, matching the triangle just mentioned. The result is a field composed entirely of triangles. 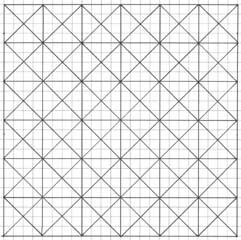 At first glance they appear identical to a field of quarter diamonds that is formed byfour intersecting sets of parallel miter cuts, but there is a difference in the arrangement of the individual elements (triangles), as shown by the following sketches. On the left, triangles are formed from subdivided hexagons; on the right, the triangles are formed from diamonds (or blocks) that have been quartered. 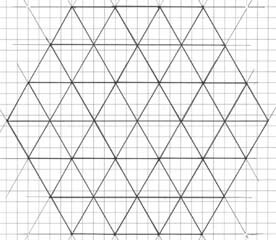 Triangles that are deeply cut are called pyramidal triangles because they form pyramids in the third dimension (height); otherwise, triangles are two-dimensional with “table top” surfaces. Pyramidal triangles used as a major motif in the patented Bedford pattern (1891) by the Mt. Washington Glass Co. 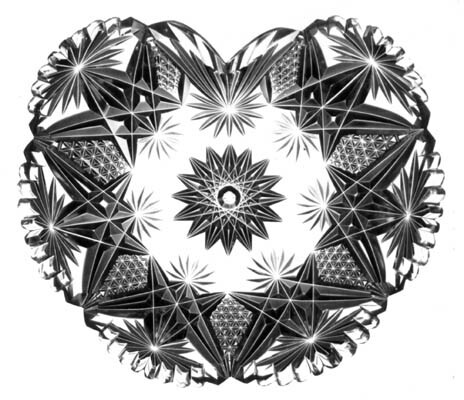 Heart-shaped plate or tray. The sub-divided hexagonal form is evident when the motif is viewed with a magnifying glass. 7″ (17.8 cm) x 6.25″ (15.9 cm), wt = 1.25 lb (0.6 kg). Sold in 1989 for $175.